Plywood and OSB (oriented strand board) structural panels are real wood, a natural insulator, and therefore provide good protection against heat loss and condensation. Large panel size also minimizes the number of joints that can "leak'' heat, airborne noise or flames. Tests conducted in 1974 by Underwriters Laboratories showed flame-spread ratings from 75 to 200 for common plywood grades. Variables in the U.L. tests included species group, glue type, thickness and surface texture. All plywood tested exhibited a flame spread of 200 or less. A decrease in flame spread with increasing panel thickness was noted for thicknesses from 1/4 to 5/8 inch. Flame spread of the interior finish is a concept that relates to the rate at which a flame will spread along the surface of a material. The best known flame-spread test is the "tunnel test" which has been adopted as ASTM test Standard E-84. The various regional and city building-code bodies have adopted flame-spread limitations for interior finish material based on recognized laboratory test methods. Flame-spread ratings for various materials are given in the table below. The lowest flame-spread rate (0 to 25) is permitted for areas where fire hazard is most severe, as in vertical exitways of unsprinklered buildings used for public assembly. Materials which rate 26 to 75 are permitted in areas of intermediate severity, such as corridors providing exitways in commercial and industrial structures. Materials rated from 76 to 200 are permitted in rooms of most occupancies except hospital rooms and the like. Tests conducted in 1974 by Underwriters Laboratories showed flame-spread ratings from 75 to 200 for common plywood grades. Variables in the UL tests included species group, glue type, thickness and surface texture. All plywood tested exhibited a flame spread of 200 or less. A decrease in flame spread with increasing panel thickness was noted for thicknesses from 1/4 to 5/8 inch. Exterior stains appeared to contribute about 30 to 50 points to the flame spread, but latex-base finish added no points. Smoke developed by plywood panels was quite low. In the UL tests, average smoke-developed values ranged from 25 to 130. Except for the average of one all-southern pine and one all-cedar test which only went to 130, none of the smoke-developed values exceeded 100, and the average of all 45 tests was 65. Tests conducted in 1985 and 1989 by Weyerhaeuser Fire Technology Laboratory showed flame-spread ratings from 74 to 172 for common OSB panels. Variables in the Weyerhaeuser tests included surface species, glue type, thickness and surface type. Plywood pressure-impregnated with fire-retardant salts is able to inhibit combustion. 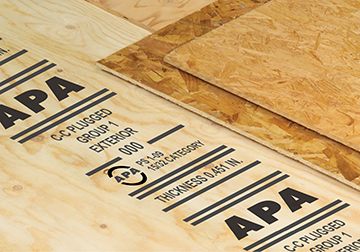 Precisely defined, FRT plywood has been impregnated with fire-retardant chemicals in accordance with American Wood Protection Association Standard U1 to have a flame spread of 25 or less when subjected to a 30-minute test. Since fire-retardant treatment involves proprietary chemical formulations that generally reduce the structural properties of plywood, technical recommendations should be sought from the company that provides treating and redrying services. Plywood may also be protected from fire by means of fire-retardant paints and other finish types. By use of certain chemicals that react under heat, these finishes create countless small insulating air pockets, a phenomenon known as "intumescence." Tests have shown flame-spread ratings as low as 10 with two coats of paint, and as low as 15 to 20 with one coat. These paints are not generally accepted by fire-code authorities, possibly because rates of application and degree of maintenance are difficult to guarantee.